I agree completely. I am 99% grain free - and when I do eat grains (especially wheat), I feel like hell. Almost like a hangover. 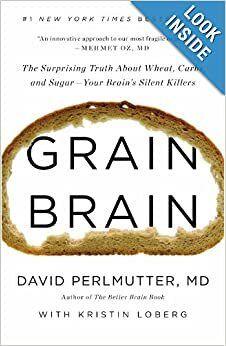 The article discusses the work of neurologist David Perlmutter, author of Grain Brain: The Surprising Truth About Wheat, Carbs, and Sugar – Your Brain’s Silent Killers (2013). Renowned neurologist David Perlmutter, MD, blows the lid off a topic that's been buried in medical literature for far too long: carbs are destroying your brain. And not just unhealthy carbs, but even healthy ones like whole grains can cause dementia, ADHD, anxiety, chronic headaches, depression, and much more. Dr. Perlmutter explains what happens when the brain encounters common ingredients in your daily bread and fruit bowls, why your brain thrives on fat and cholesterol, and how you can spur the growth of new brain cells at any age. He offers an in-depth look at how we can take control of our "smart genes" through specific dietary choices and lifestyle habits, demonstrating how to remedy our most feared maladies without drugs. With a revolutionary 30-day plan, GRAIN BRAIN teaches us how we can reprogram our genetic destiny for the better. It’s tempting to call David Perlmutter’s dietary advice radical. The neurologist and president of the Perlmutter Health Center in Naples, Fla., believes all carbs, including highly touted whole grains, are devastating to our brains. He claims we must make major changes in our eating habits as a society to ward off terrifying increases in Alzheimer’s disease and dementia rates. The FDA recommends between 20 and 30 grams of fiber per day, but most Americans aren't eating half of that. With benefits that range from weight management to cardiovascular health, is it any wonder we're an overweight nation? Here, 10 health benefits of increasing your fiber intake. Perlmutter’s book is propelled by a growing body of research indicating that Alzheimer’s disease may really be a third type of diabetes, a discovery that highlights the close relationship between lifestyle and dementia. It also reveals a potential opening to successfully warding off debilitating brain disease through dietary changes. Some in the nutrition and medical communities take issue with Perlmutter’s premise and prescription. Several critics, while not questioning the neurological risks of a high-carb diet, have pointed out that readers may interpret his book as a green light to load up on meat and dairy instead, a choice that has its own well-documented cardiovascular heart risks. “Perlmutter uses bits and pieces of the effects of diet on cognitive outcomes — that obese people have a higher risk of cognitive impairment, for example — to construct an ultimately misleading picture of what people should eat for optimal cognitive and overall health,” St. Catherine University professor emerita Julie Miller Jones, Ph. D., told the website FoodNavigator-USA. Human genes, he says, have evolved over thousands of years to accommodate a high-fat, low-carb diet. But today we feed our bodies almost the opposite, with seemingly major effects on our brains. A Mayo Clinic study published earlier this year in the Journal of Alzheimer’s Disease found that people 70 and older with a high-carbohydrate diet face a risk of developing mild cognitive impairment 3.6 times higher than those who follow low-carb regimens. Those with the diets highest in sugar did not fare much better. However, subjects with the diets highest in fat were 42% less likely to face cognitive impairment than the participants whose diets were lowest in fat. This fall, the federal government committed $33.2 million to testing a drug designed to prevent Alzheimer’s in healthy people with elevated risk factors for the disease, but “the idea of lifestyle modification for Alzheimer’s has been with us for years,” Perlmutter says, and it’s cost-free. The author hopes his book and other related media on the diet-dementia connection will inspire more people to change the way they eat. “Dementia is our most-feared illness, more than heart disease or cancer,” Perlmutter says. “When you let Type 2 diabetics know they’re doubling their risk for Alzheimer’s disease, they suddenly open their eyes and take notice. As we learn more about the brain’s ability to maintain or even gain strength as we age, Perlmutter believes, diet overhauls could become all the more valuable. Too few of us understand there’s “a big difference between eating fat and being fat,” he says. People who eat more fat tend to consume fewer carbs. As a result, they produce less insulin and store less fat in their bodies. Changing minds, however, is an uphill climb. “The idea that grains are good for you seems to get so much play,” he says. “But grains are categorically not good for you,” not even whole grains. “We like to think a whole-grain bagel and orange juice makes for the perfect breakfast,” Perlmutter continues. “But that bagel has 400 calories, almost completely carbohydrates with gluten. And the hidden source of carbs in this picture is that 12-ounce glass of fresh-squeezed orange juice. It has nine full teaspoons of pure sugar, the same as a can of Coke. It’s doing a service with Vitamin C, but you’ve already gotten 72 grams of carbs. ~ Gary Drevitch is senior Web editor for Next Avenue’s Caregiving and Health & Well-Being channels. Follow Gary on Twitter @GaryDrevitch.